QOD Gold OrganiQ is a reconstructive hair mask with keratin, white clay and nano-particles of 22K gold. When heated, the positively charged gold particles penetrate the hair cuticle,lining up the capillary fiber and leaving the hair with instantaneous shine. This is the most innovative formula that not only straightens hair, but also repairs it. 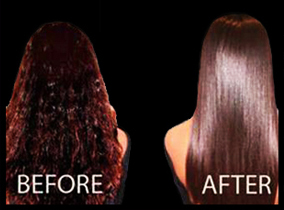 The result is smoother, healthier, shinier hair with amazing texture. QOD Gold OrganiQ is 100% natural and therefore is free from formaldehyde and aldehyde. The product does not cause an allergic reaction and is durable. This innovative formula represents the cutting edge of keratin-based conditioning and volume-reduction technology using a formaldehyde and aldehyde free formulation. QOD products are the highest quality brazilian keratin formulas available today with a well-deserved reputation for producing greater shine, smoothness and manageability than any other chemical free keratin formulas. All QOD products are carefully designed based on modern concepts, new market needs and superior ingredients.